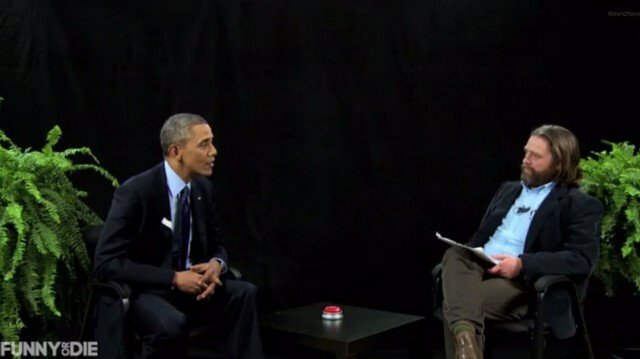 President Barack Obama has been interviewed by comedian Zach Galifianakis for his spoof chat show Between Two Ferns. Barack Obama joined Zach Galifianakis in a bid to encourage young people to sign up for health insurance. The president was asked about sending “Ambassador Dennis Rodman” to North Korea and outlawing gay divorce. Barack Obama was also billed on-screen as a “community organizer”. Streamed on the Funny or Die, the notoriously awkward chat show takes place on a sparse set, decorated with two fern plants. “What is it like to be the last black president?” retorted Zach Galifianakis. “What’s it like for this to be the last time you ever talk to a president?” Barack Obama replied. “It must kind of stink, though, that you can’t run three times?” the comedian continued. He then praised Zach Galifianakis’ previous interviews, especially one featuring his Hangover co-star Bradley Cooper, which ended with the pair slapping each other. “That was a great show. He probably carried that movie didn’t he?” said Barack Obama. The Between Two Ferns series, which began in 2008, has become a cult hit online. A typical recent video, which featured Zach Galifianakis whipping singer Justin Bieber with a belt for his bad behavior, was watched by 16 million people. Barack Obama went on to explain why he felt it was important for young people to sign up for health insurance in the US, before the deadline on March 31st. The interview ended with Barack Obama hitting a panic button, which prompted the standard black set to drop to the ground and reveal a room that appeared to be in The White House. “Thanks for letting me shoot my show here all these years,” said Zach Galifianakis, claiming former President George W. Bush had given him clearance to film in the Diplomatic Room.